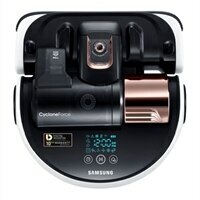 Samsung POWERbot R9250 WiFi Robot VacuumPowerful suction delivers optimal cleaning results with more suction power. Onboard digital camera and nine individual smart sensors help create an optimal cleaning path by scanning the layout of your home and its surroundings. You won't need to worry about furniture or objects on the floor. Simply turn it on, and let it do the job for you. Remotely control your robot vacuum with your smartphone, or voice control. Get consistent power with less clogging. Strong centrifugal forces separate dirt and debris into an outer chamber to maintain long-lasting suction power. Simply point for on-demand vacuum cleaning. Point the remote's light beam on the floor, and the POWERbot will follow it, cleaning as it goes. Large wheels move smoothly over obstacles, transitioning from hard floors to carpet with ease and providing the right type of cleaning action for whichever surface it's on. This combo brush is specially designed to pick up pet hair with less tangles. Its strong rotating motion helps loosen trapped dirt particles, while suction across the entire brush provides pick-up from end to end. Program your own cleaning time. Easy-to-clean, large-capacity canister can accommodate your dusty days. Powerful suction delivers optimal cleaning results with more suction power. Onboard digital camera and nine individual smart sensors help create an optimal cleaning path by scanning the layout of your home and its surroundings. You won't need to worry about furniture or objects on the floor. Simply turn it on, and let it do the job for you.